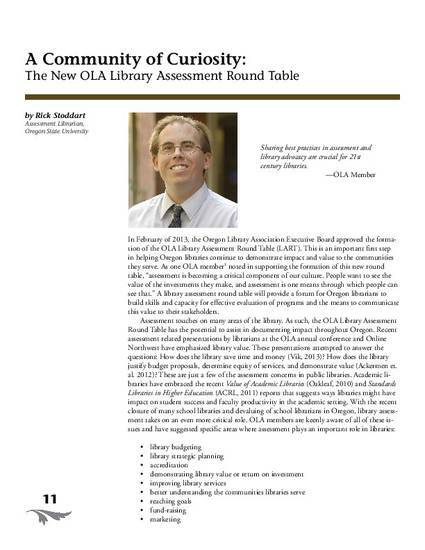 In February of 2013, the Oregon Library Association Executive Board approved the formation of the OLA Library Assessment Round Table (LART). This is an important first step in helping Oregon libraries continue to demonstrate impact and value to the communities they serve. As one OLA member noted in supporting the formation of this new round table, “assessment is becoming a critical component of our culture, people want to see the value of the investments they make, and assessment is one means through which people can see that.” A library assessment round table will provide a forum for Oregon librarians to build skills and capacity for effective evaluation of programs and the means to communicate this value to their stakeholders.